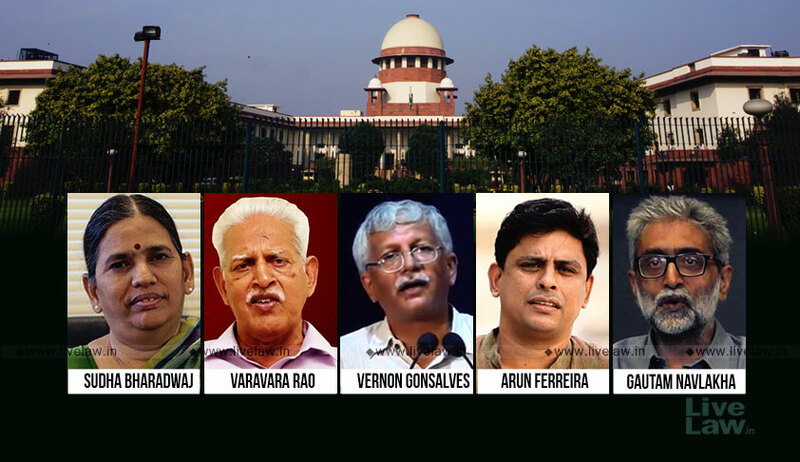 The judgment was rendered on a PIL filed by historian Romila Thapar and four other eminent persons challenging the alleged-unlawful arrest on August 28 of five activists, namely, Gautam Navalakha, Vernon Gonsalves, Arun Ferreira, P. Varavara Rao and Advocate Sudha Bharadwaj. Subsequently, four of these accused have also filed a supplementary affidavit seeking impleadment before the apex court. In view of the same, the court assumed that the writ petition has now been pursued by the accused themselves and was of the opinion that the petition, at the instance of the next friend of the accused for an independent probe or a court-monitored investigation, cannot be countenanced, much less as a PIL as the petitioners cannot be heard to ask for the reliefs which otherwise cannot be granted to the accused themselves. He had indicated the mention of guerrilla warfare and Low Intensity Conflict (LIC). The ASG had quoted the talk about “transfer of funds towards the expenditure of further operations” and the supply of some other material which he deliberately refrained from naming. He showed that an activist lawyer, who was subsequently arrested, was being scolded for having been unable to arrange the funds and that the advocate even offered a justification. He had referred to a statement in the communications recovered that “there are less enemy forces in these six regions and we will find it easier to ambush”. “Four of these places were actually ambushed!”, he corroborated. “In the present case, except pointing out some circumstances to question the manner of arrest of the five named accused sans any legal evidence to link them with the crime under investigation, no specific material facts and particulars are found in the petition about mala fide exercise of power by the investigating officer. A vague and unsubstantiated assertion in that regard is not enough”, ruled the court, indicating several of its earlier judgments where it has been held that the accused shall play no role in the Appointment of the Investigating Agency, and that an independent investigation is not to be directed as a matter of routine or merely because a party has levelled some allegations against the local police. The majority verdict also declines the prayer for an independent inquiry into the allegations made in the FIR lodged on January 2, at the behest of eye-witness Anita Savale, purported as the zero FIR, which imputes the Bhima-Koregaon violence to Hindutva activists Sambhaji Bhide and Milind Ekbote. It may be noted that the Counsel for the petitioners had questioned the propriety of another FIR registered on January 8 at the instance of Tushar Damgude, in pursuance of which the first batch of arrests was made in June, followed by the arrests on August 28. “That is an independent FIR registered at a different police station against the Hindutva right wing leaders Milind Ekbote and Sambhaji Rao Bhide. It is, at best, in the nature of a cross FIR in respect of the same incident against the alleged aggressors filed by an eye-witness. Neither the writ petitioners nor the named accused in FIR No.4/2018 (by Damgude) in that sense, can pursue relief in respect of FIR No.2/2018 (by Savale)....we find force in the argument of the State that the crime under investigation in FIR No.4/2018, inter alia is to investigate the allegations that a banned organisation, CPI(M), organises events such as referred to in FIR No.2/2018 to propagate ill-will in different classes and turn them into unconstitutional and violent activities”, the judgment avers. Further, the third relief sought that “all electronic devices, records and materials, allegedly seized from the detenue/accused, be examined at a Forensic Science Laboratory outside the state of Maharashtra to ensure fair play and in the interest of justice” has not been taken forward. Finally, as for the plea to direct the release of the arrested activists from custody, the court has extended its interim order placing them in house arrest by another four weeks, granting The accused persons the liberty to pursue this relief before the appropriate court. While the majority of CJI Misra and Justice Khanwilkar turned down the prayer for a probe by a SIT, Justice D. Y. Chandrachud opined that the same was necessary as Maharashtra police was biased in the matter. He expressed a strong dissent in the Bhima Koregaon case to hold the arrests of five activists to be wholly baseless and politically motivated. Justice Chandrachud dissented from the majority to hold that the arrests were without any basis. He said that the Maharashtra police was biased and cannot be trusted. Therefore, he held that a court monitored investigation by SIT was necessary. "Court has to be vigilant to ensure the liberty of those who take up unpopular causes.Voices of opposition cannot be muzzled because it is a dissent", he noted. The petition was filed by five persons led by Professor Romila Thapar against "arbitrary arrests" of human rights defenders including Sudha Bharadwaj and Gautam Navlakha citing "Maoist links" in the Bhima-Koregaon case. Protesting the "arbitrary" arrests, the petition said the arrests were made without a shred of evidence and alleged that an emergency-like situation existed in the country. The petitioners demanded a Court-monitored SIT probe in the matter. A bench headed by Chief Justice Dipak Misra and Justices Khanwilkar and Chandrachud held that five rights activists–Varavara Rao, Arun Ferreira, Vernon Gonsalves, Sudha Bharadwaj and Gautam Navlakha– should be kept at at their respective homes till the disposal of the petition. "The use of draconian Unlawful Activities (Prevention) Act against these activists who have no history of indulging or instigating any violence is clearly malafide and an attempt to browbeat and intimidate the dissenting voices," the petition said. Petitioners' counsel Dr. Abhishek Manu Singhvi contended that arrest and search were carried out in blatant violation of procedure. The witnesses who attested the arrest and search memos were brought by Maharashtra police from Pune, and were not local residents. Also, during the pendency of the case before the SC, the Maharashtra police had gone to press alleging that the activists were involved in a plot to assassinate the PM, even though such an allegation was conspicous by absecence in the FIR and the remand applications. He therefore contended that the attempt was to create a general impression that the activists were terrorists, even though there was no material on record to support such charges. The Maharashtra Government defended the arrests stating that they had collected enough evidence to establish links of arrested activists with the Maoist organization. The maintainability of the PIL at the behest of third parties was also questioned by the Government. The issue has genesis in the multiple arrests and raids carried out by Pune police yesterday in several cities. The activists were arrested for their alleged Maoist link triggering Bhima-Koregaon violence in Pune on January 1, 2018. Gautam Navlakha is a civil liberties activist, who had association with People's Union for Democratic Rights. He is an editorial consultant of Economic and Political Weekly. His residence in Delhi was raided by Maharshtra police on August 28. The police arrested him and secured a transit remand from a Saket court to take him to Pune. The remand order was stayed by the Delhi High Court. The bench of Justice Muralidhar and Justice Vinod Goel heard the matter in detail. After finishing hearing, the Delhi HC had started dictating order in the petition. Meanwhile, the SC passed the order in the petition filed by Romila Thapar and others. On knowing about the SC order, the Delhi HC bench halted the proceedings and adjourned the matter. Lawyer-activist Sudha Bharadwaj, who is known for her trade-unionism and civil rights activism in Chattisgarh for almost three decades, was arrested from her house at Badarpur in Haryana yesterday. Immediately after her arrest, a habeas corpus petition was filed in the Punjab and Haryana High Court. The HC ordered that she should be kept at her house till the Magistrate decided on the transit remand. The HC also directed that the Maigstrate should examine compliance of provision of Section 41 and 50 of the Code of Criminal Procedure by the police before issuing transit remand. However, by the time the High Court order came, the Chief Judicial Magistrate Faridabad had granted transit remand of Bharadwaj to Maharashtra police. Following the HC directive, the CJM recalled the first order, and held that she should not be taken out of Haryana. Arun Ferreira is a Mumbai based activist, who was arrested in 2007 on suspected Maoist links. He was acquitted of all charges in 2014. He has written a prison memoir titled "Colours of Prison", describing the torturous and inhuman treatment meted out to prison inmates. After his release from prison, Ferreira took law degree and enrolled as a lawyer, taking up cases of persons languishing in prisons without legal representation. Mumbai-based Vernon Gonsalves was a social activist in Chandrapur district of Maharashtra. He had earlier faced UAPA charges on suspected maoist links and was made accused in 20 cases. He was released in 2013 after serving sentence on conviction under UAPA. Varavara Rao is a 78-year-old Telugu poet. He is known for his poems calling for revolution by the workers' class. He founded a group of revolutionary writers named "Virasam". He had undergone imprisonment several times for his radical ideas.